This is the very popular co-axial Lama V3. I think that, for a time, more people got started in the hobby with the E-sky lama V3 than anything else. When I went to my LHS for the first time and mentioned some of my trials and tribulations with this RC hobby the owner said I should really consider one of these and when I get good at that then move on. He was right. This is a good beginner helicopter. It isn’t as stable as some of the newer ones out now but at the time this was the thing to have. It is still available although its popularity has waned some. 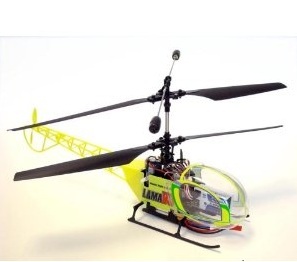 This is a 300 – sized helicopter that is a coaxial with no heading-hold gyro. The stability is controlled by the counter-rotating blades. This one uses two 370 motors and stiff hard plastic blades for lift. The tail, while looking cool, is purely ornamental. It is pretty stable but with just enough twitchiness that you do have to ‘ride the sticks’ just a little. In this case it is a good thing because it will teach you a little bit better about control and flying that some of the newer co-axials out there because the newer ones are so stable that there isn’t much instability to compensate for that you will feel when you go to a larger fixed pitch or collective pitch helicopter. This one you can fly it so it will get away from you. This heli is VERY durable. I must have somewhere in the neighborhood of 150 flights on this. I crashed and my son crashed and I ran into furniture and my son shot it up to about 200 feet an then let it just fall from the sky in a panic. I have had to replace the landing gear twice, some screws, the tail section once, the main shaft twice and blades at least 8 times. Yet it still will fly although it does have an odd noise so it sits in retirement near my TV. I would have no qualms in recommending this as a first or second helicopter for someone. There are people who sell hop-ups for this heli. I got a full set of aluminum head pieces and after installing and flying with them for about a month I took them all off and re-installed the original plastic pieces. This one just flew better with the original stuff. What I got out of the hop-ups was that the heli started to become unstable and difficult to fly. It did go faster but that really didn’t help when the heli was sliding around out of your control.